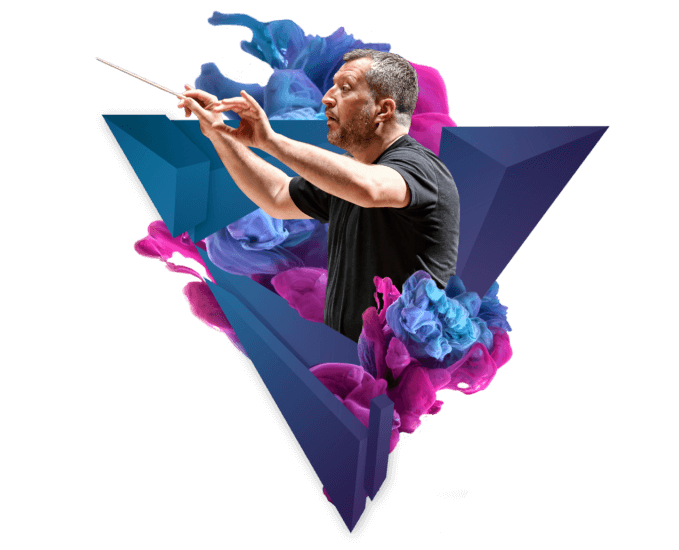 In Spring 2017, Britten Sinfonia launched a new three-year Beethoven Symphony Cycle, with Thomas Adès as director and conductor. Adès interleaves Beethoven’s masterworks with the audacious and sometimes explosive music of the wonderfully idiosyncratic Irish composer, Gerald Barry, exploring these monuments of the orchestral repertoire. Hearing how one of the most celebrated composer/conductors working today will interpret and illuminate these iconic works, is sure to be a major event in the classical music calendar. Book both Symphony Cycle concerts in Year Three at London’s Barbican Centre and receive a 10% discount. Read the reviews from the first concert in the Beethoven Symphony Cycle, featuring Beethoven’s Symphony No. 5. Find out more about Joshua Bloom, who will be singing Gerald Barry’s The Conquest of Ireland during the Beethoven Symphony Cycle. Thomas Adès talks about conducting Beethoven’s symphonies, and why he chose to pair them with the works of Gerald Barry. Support our Beethoven Symphony Cycle appeal and help us realise our ambition to release a CD box set of live recordings of the entire symphony cycle. Britten Sinfonia Chief Executive, David Butcher, reflects on year one and what we’ve got to look forward to this year and next. Read the reviews from the second concert in the Beethoven Symphony Cycle, featuring Beethoven’s Symphony No. 3 “Eroica”. Read the reviews from the chamber concert, featuring Thomas Adès, Gerald Barry and principal musicians from Britten Sinfonia. Read the reviews from the first concert of the Beethoven Symphony Cycle. Violinist Alexandra Caldon talks about the total genius of Beethoven’s music in this film. Britten Sinfonia’s Chief Executive and Artistic Director explains why he’s so excited about the upcoming Beethoven Symphony Cycle. Britten Sinfonia leader, Jacqueline Shave talks about what Beethoven means to her in this short film. Nicholas Daniel, Britten Sinfonia’s Principal oboe talks about the joy of playing Beethoven in this short film. In this film, key players in the Beethoven Symphony Cycle discuss their first memories of hearing Beethoven’s music. Baritone Mark Stone talks about his career and his musical memories in this Q&A with him. Mark joins Britten Sinfonia for the first Beethoven Symphony Cycle concert. Ben Eshmade talks to Britten Sinfonia leader Thomas Gould, composer and conductor Thomas Adès, and composer Gerald Barry about Beethoven’s influence on them.